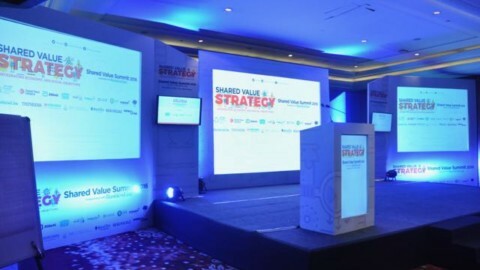 Shared Value Summit was organized by Shared Value Initiative India, Shared Value Initiative, Institute for Competitiveness (India), India Council on Competitiveness and Vivekananda International Foundation at The Leela, Ambience Island, Gurgaon. 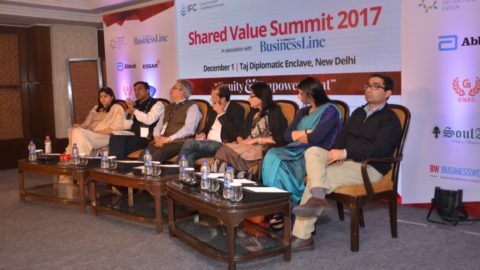 Shared Value Initiative India is the regional partner of the Shared Value Initiative, whose founders are Professor Michael E. Porter of Harvard Business School & Mark R. Kramer. 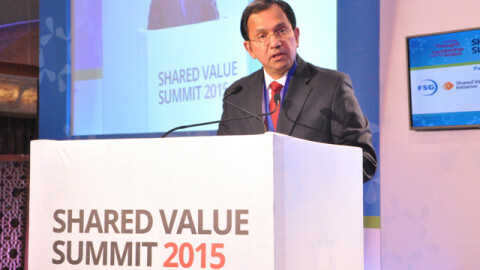 The Shared Value Summit 2015 is a unique configuration of deliberations amongst a varied cross-section of practitioners, thought leaders, government leadership and corporate honchos. The summit includes interactive, meaningful panel discussions, keynotes from national and international speakers on creating shared value. 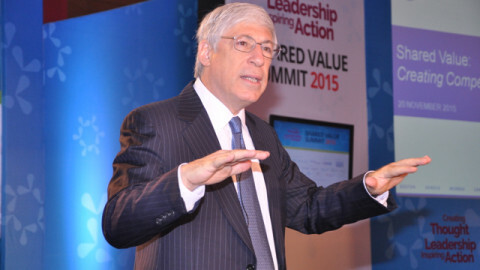 The Creating Thought Leadership & thus Inspiring Action theme of the summit was articulated by Dr Amit Kapoor, Chairman, Shared Value Initiative India, while laying open the summit. 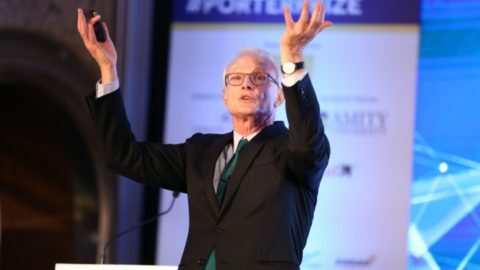 The foremost keynote was Mark R Kramer, the co-creator of the concept of shared value with the renowned Prof Michael Porter of the Harvard University. Mark R. Kramer highlighted the limited role of philanthropy based corporate social responsibility in solving social problems. The assertion driven home was the tremendously important role the businesses can play in resolving issues our society and economy. Citing numerous innovations practiced by corporates in India and abroad, it was inspiring to see how business can build scalable and sustainable business models to solve the socio-economic needs (poverty alleviation, agricultural recessions, inclusive growth mandates, and health problems et al.). He emphasized the need for profit to be a healthy aspiration, for that is what makes the whole endeavour sustainable. Nevertheless, the role of government and NGOs was inescapably significant, for therein the efficiencies based on learning curve arise. Blessings to the event were sounded by Pujya Swami Chidanand Saraswati, chanting a holy Sanskrit shloka, which his guru had indoctrinated to him when he was just eight years old, ready to depart to the forests for decades of journeying and staying with seers and philosophers. Swamiji urged businesses to adopt values of acceptance and respect for all and linked Corporate Social Responsibility (CSR) to Human Resource Responsibility (HSR). Swamiji left concluded with a thought-provoking statement for businesses, asking them whether they are operating in peace or pieces. Sadhvi Bhagwati Saraswati stated that how businesses are the most critical cogs in the wheel of the development of any nation. Stressing on the fact that corporates and society need to go together, she suggested that to make a long-term success corporates should share the value it creates for society rather than keeping it in a vacuum. Sharing some of her thought provoking stories, she highlighted that doing well and doing good needs to go together. This is what shared value is all about, to expand the values of products and services a business creates. She infused a very relevant and should be practiced thought among the audience that corporates should supply products for societal needs and not for their greed. Corporates need to realize that the society that they create is the one in which they would have to live. She brought to fore that adopting shared value is the only solution that will enable a sustainable, bright & positive future for businesses and society. 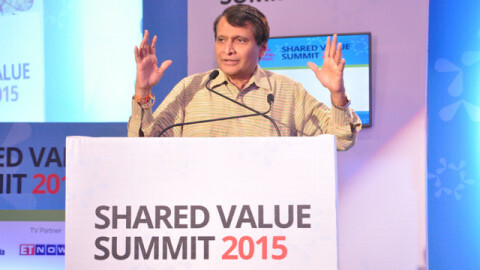 The chief guest, Shri Suresh Prabhu, Honourable Union Minister of Railways, Government of India, delivered a keynote relating the role of government and role of businesses in society. India needs sustainable business models under which companies work along with the government to bring prosperity to a large number of people in the country, said the Minister. “Businesses should focus on creating new products and services that help people access something which they aspire for but were never able to get,” he said, in his address at the summit. Sustainable long-term business models cannot exist in which businesses gain, and consumers lose, Prabhu said. He added further, “Businesses need to focus on bringing more and more consumers to the marketplace and, therefore, need to create products and services that target people at the bottom of the pyramid”. At the same time, the government’s policy role focuses on creating purchasing power so that more people have more money in their pockets, he said, adding that the current government’s policies like direct cash transfer are aimed at giving purchasing power to the vulnerable sections of society. “We need institutions that protect consumer interest; we need enlightened minds and leadership, and we need awareness so consumers can make informed choices. Ultimately, aligning business interest to society is better for the long term. This is important for sustainable business models to have an effective outcome and create social public good,” the minister added. The Minister further added that the Shared Value Initiative is making an impact with the right partners. The other speakers later in the day are Naina Lal Kidwai of HSBC, Suresh Narayan of Nestle, Geetu Verma of HUL, Siraj A Chaudhry of Cargill India, Himanshu Jain of Sealed Air, Justin Bakule of Shared Value Initiative, Sumantra Sen of JSW Foundation, Gopala Krishnan, Richie Ahuja of Environmental Defense Fund, Shelly Batra of Operation Asha, Susan Beverly of Abbott et al.